General Data Protection Regulation (GDPR), Information Security Management System (ISO 27001), Environmental Management Systems (ISO 14001), Quality Management System (ISO 9001, ISO 13485)? Modern world is in a state of flux and organizations are continuously facing new regulatory requirements. Meet them all using ins2outs — a modern and lean Organization Management System. Ready-to-use, well-defined and available in the cloud, ins2outs will help you to meet any regulatory requirements in a quick, easy and lean way. Your client is asking for personal data security? You need to have ISO/product certification in order to sign a contract or launch a product? With ins2outs, you can quickly buy know-how, or define it on your own, and introduce it easily to any part of your Organization. The promptness is assured by a ready-to-use system structure and zero up-front infrastructure investment. 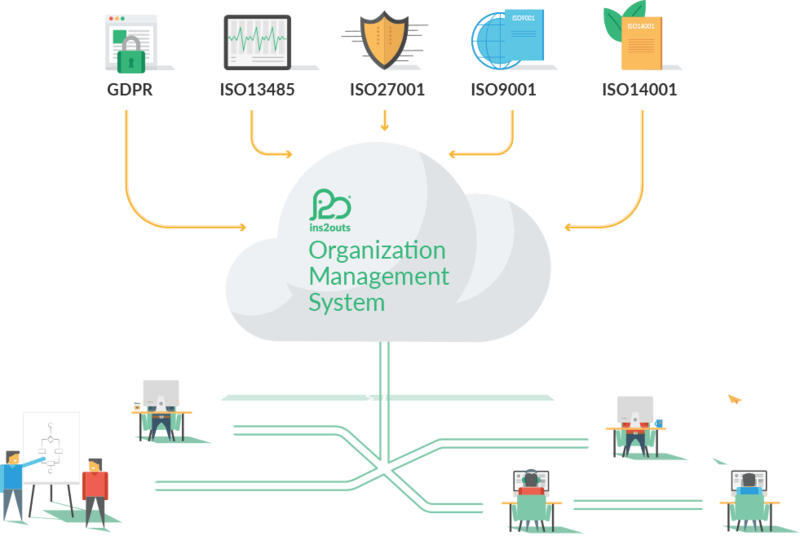 ins2outs supports integrated management systems. Acquire or define policies, processes, procedures, instructions and document templates. Use built-in online trainings to introduce your employees to the assigned Roles in the Organization. Forget about bureaucracy or unstructured electronic documents. The change project in your organization has missed another milestone and exceeded the budget? Your organization is planning to enter new markets? Don’t waste your time waiting. With ins2outs, you can buy any know-how set directly from our platform or from external consultants’ individual offers. You do not have to reinvent the wheel on your own. Instead, you can focus on applying the best practices from your organization to the acquired know-how and customize the latter to your unique needs. This way you can reduce both the time and the budget of such a project by more than a half. Your employees are the best experts of your Organization’s business, so take advantage of it. Define and document your know-how with ins2outs. The system will automatically notify all your users, depending on their role assignment, about the new content to learn about. Comments, likes, notifications and other collaboration patterns from social media will improve your internal communication. All of that results in improved and mastered know-how shared in your Organization. Is your business growing and are your operations improving? ins2outs will support both. Thanks to the organization know-how you can scale up your business. Meeting regulatory requirements quickly and in a professional manner will allow you to enter more profitable market and gain a competitive advantage. Know-how grouped around Roles descriptions and enriched with training and competencies enables your Organization to expand your team without effort. ins2outs will assist you in continuous improvement of your business and organization. If your organization does not have its own know-how, you can buy a ready-to-use know-how set either directly from the ins2outs platform, or from any consultant. The know-how set is then delivered to your ins2outs account within a few days. The acquired know-how should be customized for your Organization’s needs. For that, you can either use one of the consultants available on ins2outs platform or do it internally in your organization. Now, you have a know-how set tailored for your organization. By assigning people to the Roles on ins2outs you let the system automatically notify them about the know-how they should follow. In case, certification is one of your goals, ins2outs will help you to achieve it. A well-defined management system, documented information required during audits, or compliance with normative sources – are just some of the Features that will help you. Use your internal organization experts for mastering your know-how. Social media and collaboration features will help you to build a competitive advantage of your Organization. You choose what you want. Check out the most common package options when working with ins2outs. *Planning for 100+ users? Ask for individual pricing. I hereby give consent to process my personal data by Pro4People for the purpose of processing the submission, responding to it, and contacting me in the future to present commercial offers. Pro4People sp. z o.o., based in Wrocław, Poland at Wołowska 18 (postal code 51-116), will be the controller of your entrusted personal data. Your personal data will be processed for the period of 3 years from the moment of the last contact. Your data will be processed under the General Data Protection Regulation (GDPR) and derived Polish national regulations. The base for processing is your consent, thus you can execute all the individual rights derived from GDPR at any moment by contacting us at gdpr@pro4people.com. Pro4People may transfer your personal data only to its Trustworthy Suppliers providing supplementary services to us for the purpose specified in this consent.